Last year around this time, there were rumors of a Taylor Swift Katy Perry diss track! Fast forward a year we have 1989 single “Bad Blood”. One by one, Taylor Swift has been revealing the characters from the anticipated forthcoming video. The all-star line up includes Taylor Swift as the Catastrophe, Lily Aldridge as Frostbite, Zendaya as Cut-Throat, Paramore’s Hayley Williams as The Crimson Curse, Gigi Hadid as Slay-Z, Elli Goulding as Destructa X, Hailee Steinfield as The Trinity and Lena Dunham as Lucky Fiori. The Sin City-inspired video was directed by Joseph Kahn known for Eminem’s “Love The Way You Love” featuring Rihanna, Britney Spears “Toxic”, Taylor Swift’s “Blank Space” amongst many other popular music videos! Based off of the cast, director and promotion, this video is going to be a classic! I wonder if Taylor Swift will be firing shots at Katy Perry!? 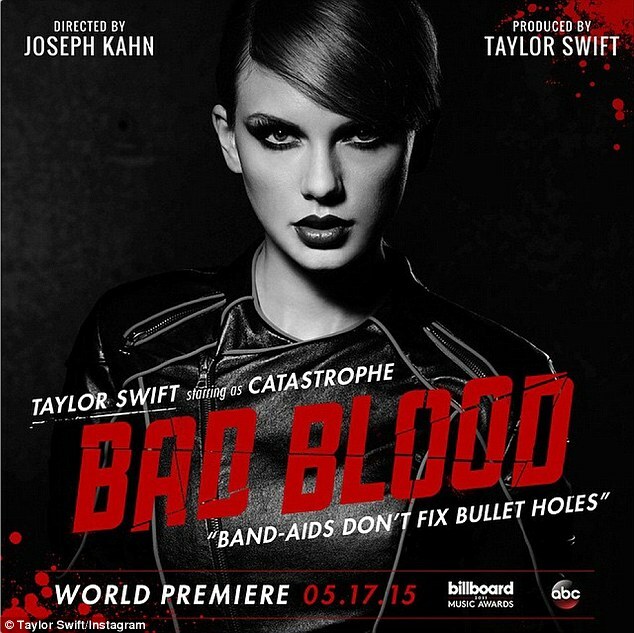 Taylor Swift’s “Bad Blood” will premiere during the Billboard Music Awards on Sunday, May 17, 8 – 11 p.m. EST on ABC! Check out Taylor Swift’s “Bad Blood” below!